Posted 1/2/17 – According to a post on the Sierra Madre Rose Float Association’s Facebook page, Post Parade ends officially on Tuesday, Jan 3rd at 5PM. Once the Tournament folks release SMRFA and The Cat’s Away, the float will head to Sierra Madre, likely between 6PM and 8PM. WEATHER PERMITTING, the float will stay overnight at Kersting Court from Tuesday evening until Wednesday afternoon. There is sensitive equipment on board the float to which the slightest rain could be damaging, so keep your fingers crossed. 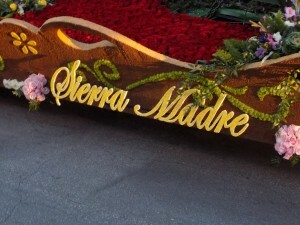 If SMRFA can’t stay at Kersting Court due to weather, Sierra Madre’s award winning float will be parked at The Barn for typical post-parade flower sales, etc.